Sega on Wednesday announced that Sonic Mania Plus, an expanded version of last year’s retro-inspired Sonic platformer, will arrive this summer. Sonic Mania Plus builds on the success of last year’s release by introducing two new playable characters from earlier Sonic games – Mighty the Armadillo and Ray the Flying Squirrel (both appeared in 1993’s SegaSonic the Hedgehog arcade game). There’s also a new Encore mode that revamps familiar zones with new layouts and challenges, a new four-player option for Competition and Time Attack modes and ghost challenges for time trials. Sega also dropped a new trailer for the game complete with animation from Tyson Hesse. Sonic Mania Plus is up for pre-order as of writing for PlayStation 4, Xbox One and Nintendo Switch for $29.99. 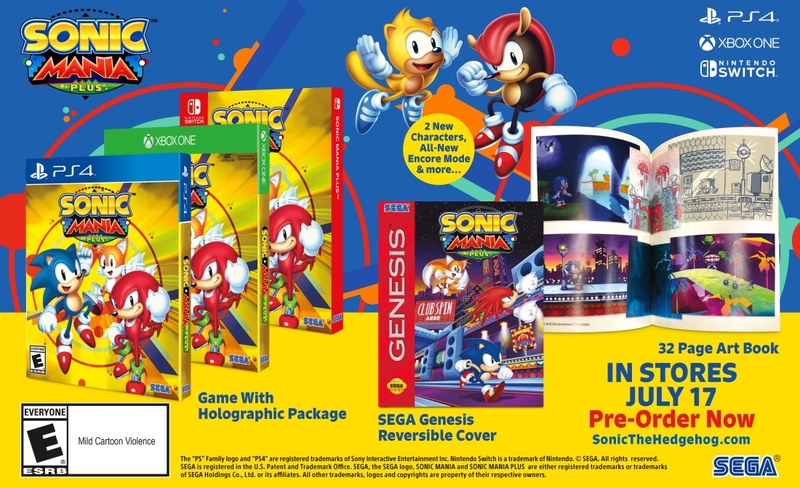 The retail version will include a 32-page collector’s art book, a reversible Sega Genesis cover and holographic packaging. Those who already own the original digital version of Sonic Mania can pick up the new content via a $4.99 DLC that’ll also be available when Sonic Mania Plus launches in North American and European markets on July 17. When are they going to finally add "Felix the Cat" as a playable character?